Regent University Robertson School of Government (RSG) alumna Sabrina Wooten ’98 served as a police chaplain, a CFO and a pastor. Now, after a sweeping victory in a local election, she’ll serve a city of more than 440,000 people as a Virginia Beach City Council Member. 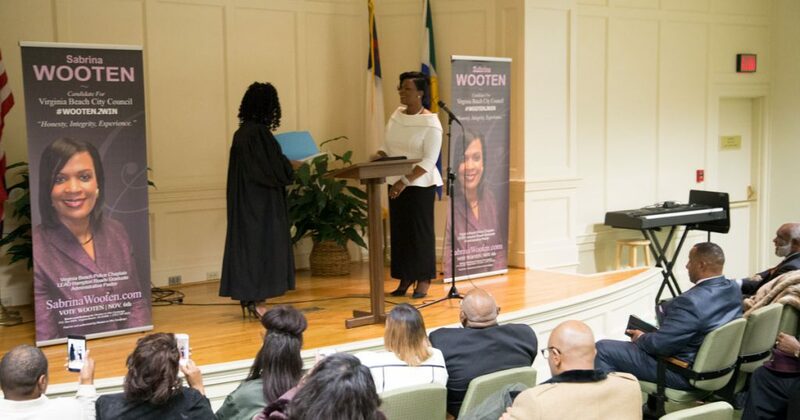 On a cold Wednesday night earlier this week, more than 50 people gathered at Regent University to watch Wooten be sworn in her new role by fellow Regent alumna and Virginia Beach Juvenile and Domestic Relations District Court Judge Tanya Bullock ’00 (LAW). For the first time ever, two African-Americans — Wooten and at-large candidate Aaron Rouse — will simultaneously hold seats on the Virginia Beach City Council. “I’m so proud of you on so many levels,” Bullock told Wooten. Wooten’s initial campaign budget was tight. She didn’t have a campaign manager and encountered many who said she was lacking in resources. Still, she received what she needed — not just financially — but from a prayer team of friends. As support came in, so did the votes. Running on a diverse platform involving educational development, local business growth and combatting human trafficking, Wooten not only claimed 61.88 percent of total votes, but placed first in all 100 precincts she ran in.